Here is a little teaser…..
Old boarding school chums Jay Gordon and Walter “Smitty” Smith reunite for a cross-country road trip after a long estrangement. Jay, in particular, has a story to tell, and uses the open road to mend the fences of their friendship and explain his conspicuous absence from Smitty’s wedding three years earlier. Having reasonably matured into successful thirty somethings, they now live on opposite coasts, but through an “old school” journey they revisit the lighthearted mischief of a bygone era. The story unfolds on the highway inside a Range Rover Sport, with the nostalgic sounds of 80s rock permeating from Jay’s iPod; Axl, his loyal basset hound, nestling comfortably in the back seat. 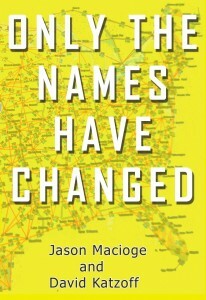 Although the road trip itself becomes a major player—presenting its three travelers with obstacles and adventures to deal with—at its core, Only the Names Have Changed is primarily a flashback narrative that chronicles the lives of Jay Gordon and Madison Horn, a troubled girl with whom Jay has amassed a lifetime of implausible stories.